We are located on the first floor next to the yellow staircase in the Auraria Library. Use the New Interactive Floor Maps to view where the DMS space is located inside the library. 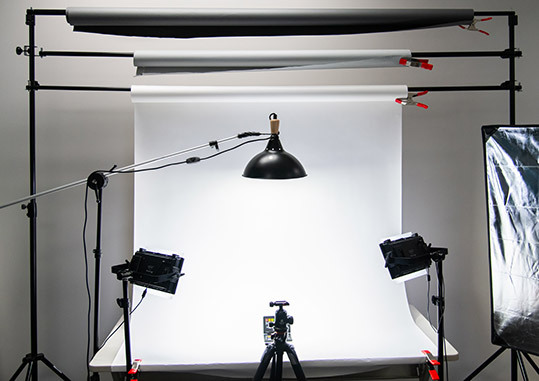 Students, faculty, and staff from CU Denver, MSU Denver, and CCD may reserve the DMS portfolio photography, video and audio recording studio for 30 minutes up to an hour and a half. For same day reservations, please call 303-315-7760 to confirm availability. The audio studio can be used for recording interviews and narration only, not music. For cancellation policy information please visit DMS Cancellation Policy page. The DMS maintains the Auraria Digital Resources collection, available through ArtStor, and handles faculty requests for the digitization of video, audio, and printed materials to support teaching, learning, and research. Items digitized will be added to this collection. Upon request, items may be digitized with subtitles embedded in them; however, we do not have the ability to provide captioning. Digitization requests are handled in the order they are received and require a minimum of two (2) weeks to complete. At the time of placing your request, we will give you an estimate of when digitization will be complete. Please be aware that prior to being filled, all digitization requests will be reviewed for compliance with the Auraria Library Digitization Policy. We are unable to fill requests that are not in compliance with this policy. Making Powerful Presentations - Lead dynamic presentations using Powerpoint, Prezi, and other tools.